Cave paintings are paintings on cave walls and ceilings. Usually these paintings were made in prehistoric times. Most cave paintings date from 10,000 to 20,000 years ago. The oldest are from about 32,000 years ago, but scientists still disagree if this dating is correct. It is not known why these paintings were made. Most people think they may have had a function for rituals. They may also have been a way to transit information; to tell other people about something. Most paintings are in caves that are difficult to access. These caves usually also do not show signs that people lived there all year round. 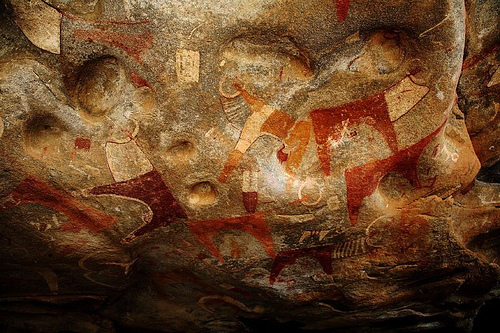 Today, there are about 350 caves known which have paintings in them. Many are in France and Spain. The best known are probably the caves of Altamira (in Spain), Lascaux (in France), or Creswell Crags in England. Sometimes, paintings were also done on cliff faces. Fewer of those have survived though, because of erosion. One such example are the rock paintings of Astuvansalmi (in Finland). Most often, animals or hunting scenes were painted. Sometimes hands are there too. Rarely, there are also more abstract patterns. The paintings were drawn with red and yellow ochre, hematite, manganese oxide and charcoal. Sometimes the silhouette of the animal was put into the rock first. Schematic paintings of animals, such as horses and mammuths. Very often only the head or back of the animal is shown. Lines and dots often used in addition. Sometimes, schematic vulvas are shown. Exact dating is difficult. Peak of development of rock art. Lines are finer, and people tried to show animals in motion. Very short legs, and body, which appear too large when they are compared to the head. The marked lines of the back, which are very pronounced in style II are less pronounced. Horns and antlers of animals are often shown in a perspective view. Very often, bisons and horses are painted. They are commonly shown in the same drawing. Other animals are often shown as extras. There are signs that almost always appear next to the animals. Humans are shown in relation to the animals, for the first time. 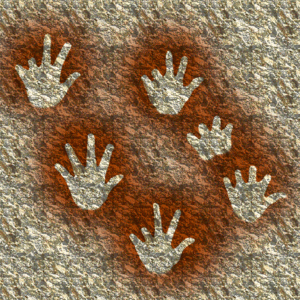 Positive and negative imprints of hands are present. Most caves are in this style. Mobile objects appear, and allow a further classification of this style. Animals are shown in a very realistic manner. Horns and antlers are also shown realistically, and no longer in perspective view. Horses have a marked belly, and two lines on their shoulders. Bisons have a triangle on their loins. There are different symbols next to the animals. It could be a form of hunting magic, which is meant to increase the number of animals. Another explanation is closely related, and was found by examining hunter-gatherer societies: These paintings were made by shamans. The shaman would retreat into the darkness of the caves, enter into a trance state, and then paint images of their visions, perhaps with some notion of drawing power out of the cave walls themselves. It could be some form of graffiti, mostly done by adolsecent males of the time. Venus figurines which have roughly the same age were also found. According to this theory, there were many adolescents in the society of the time. Most of the adolescents who painted were male, but some were female. 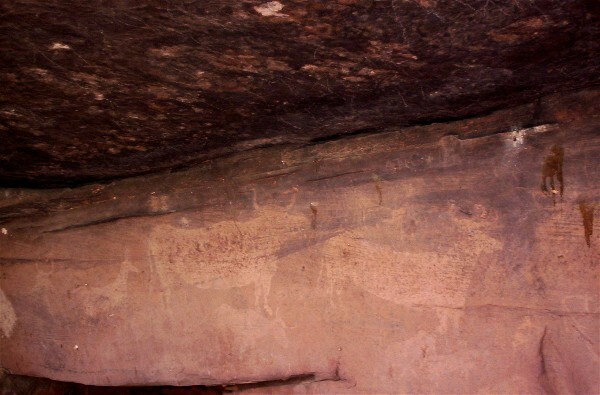 The paintings may have been made for practical reasons: There is some hidden symbolism which may show the techniques of hunting, or the routes the animals took. People painted what they wished for or what they had dreamt of. Alternatively: these paintings were seen as "art" at the time. There are several societies today, who do not have a word for art, but who practice the same painting. Cave painting Facts for Kids. Kiddle Encyclopedia.